When you get too many cooks in the kitchen, something is bound to go a little bit wrong. Since my book has come out, there have been two errors discovered. These are not in the main Hazel’s Diary quilt, but in a couple of the bonus projects — my two favorite bonus projects, no less! 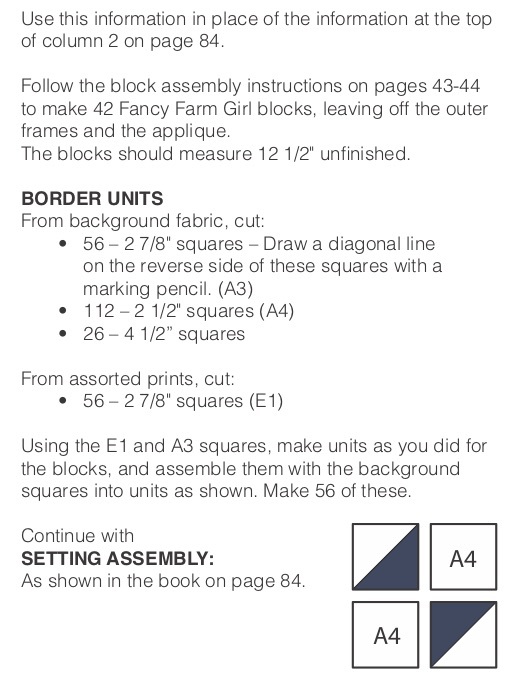 So if you have a copy of the book, and these corrections are not included in your copy, please make note of them now. The first correction is simply a typo, as far as I can tell. It’s under the bonus project, Happily Ever After, which is on page 74. The second correction is a bit more involved, and it’s under the bonus project, Fancy Farm Girl, which is on page 82. This is still my favorite quilt in the book! You can download this correction as a PDF file by clicking here: Fancy Farm Girl Correction. Then you can print it out and put it with your book, so you’ll have it. When these were first discovered, I was hugely disappointed, but upon looking through all the other errata posted on C&T’s website, I realized that my book is not nearly the only one this has ever happened to. I just wanted so badly for it to be perfect! I apologize if this has caused any of you a problem when making either of these quilts, too. I guess no matter how hard you try, you can’t catch every single thing, when there are too many pairs of eyes on it, and too many copies of it floating around amongst all the editors. Lesson learned the hard way! If you have any further questions, don’t hesitate to ask. And as always, Happy Stitching!